Cosmo Recommends: Extend Your Summer Vacay In Hong Kong! Who says you can't have fun in the sun this rainy season? There's one place where you can: Hong Kong, where summer has just begun! 1. Enjoy a bird's-eye view of Hong Kong! Sky100 is an observation deck offering 360-degree views of Asia's world city. Located at the 100th floor of Hong Kong's tallest building, the International Commerce Centre (ICC), its perfect location allows visitors to see Hong Kong in two different perspectives. Visit the deck during the day to see the hustle and bustle of the city, or have fun locating your next destination. If you're going on a trip with your honey, drop by at night to witness the breathtaking view of the city filled with dazzling lights. For more info visit Sky100's website. 2. Let the good times roll at an outdoor festival! Fine food, great beer, interactive games, and a cheerful crowd are the main features of Hong Kong's Lan Kwai Fong Beerfest. With over 60 booths, you and your barkada will have a blast sampling a wide array of food and drinks from different restaurants while watching or participating in various contests. Find out more about Lan Kwai Fong Beerfest here. 3. Beat the heat with an aqua adventure! Check out Ocean Park Hong Kong's Summer Splash for the latest summer programs for the whole family. Ride a raft and race down river rapids with the exotic sounds of a tropical rainforest, or catch different animals from the world's smallest monkey to the world's largest rodent. Then, head over the Waterfront to see the high-diving aerial acrobatics of Ocean Park Hong Kong's professional divers. Cap off your Ocean Park trip with a splashing good time at the interactive water playground, Kung Fu Panda 2 Wild Wet Zone. Visit this site for more info. 4. Celebrate Hong Kong Disneyland's 5th Anniversary! Be the first to experience the world exclusive's all-new Flights of Fantasy Parade! The parade takes interactivity to new heights, so don't just stand there and watch, join the celebration and feel the excitement as you and your little siblings or pamangkins dance along with your favorite Disney characters on a sky-high celebration! You can also turn up the heat on your summer of fun with Lightning McQueen and his friends from the Disney/Pixar movie Cars 2. Race around the world and enjoy fantastic international food, photo scenes, and collect country stamps in your passport. Then go on a secret mission behind the racetracks! For more information, check out this site. 5. Go on a crazy shopping spree! Good news for Cosmo shopaholics: the Hong Kong Tourism Board (HKTB) and Visa are giving out amazing offers for Visa card holders! Two exciting promos are now going on: Pay by Visa and Visa go Surprises! To qualify for the Pay by Visa promo, just spend over HK$100 with a Visa card within the period, register on the Visa website, and shop away! Three lucky shoppers with the highest total number of transactions on their Visa cards will win Visa spending credits worth HK$10,000! Meanwhile, for Visa go Surprises promo, all you need to do is drop by participating Hong Kong shopping malls every Saturday between 3PM to 6PM and you'll be in for a surprise! Just make sure to bring your Visa card with you when you travel. HKTB and Visa are giving more opportunities for fun shopping, so wait for more shopping promos! See this site for more details. Here's a Cosmo exclusive: Want to win a free trip to Hong Kong? 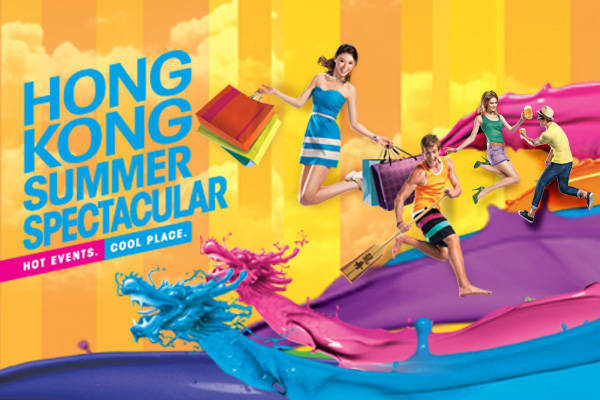 Stay tuned for more information on Hong Kong Summer Spectacular and brace yourselves for an upcoming contest that'll test your fashionista skills! Launch the gallery to see some of the cool attractions awaiting you in sunny Hong Kong.